German Protestant theologian, poet, and writer; born at Mohrungen, East Prussia, Aug. 25, 1744; died at Weimar Dec. 21, 1803. He studied theology, philosophy, and the humanities at the University of Königsberg, where he acquired a vast knowledge of German and foreign literature. In 1764-69 he was teacher and preacher at Riga; in 1771-76, court preacher and member of the consistory of Bückeburg; from 1776 until his death, court preacher and member, later president, of the consistory of Weimar. His works on Hebrew Biblical literature exercisedgreat influence. His "Die Aelteste Urkunde des Menschengeschlechts" (Riga, 1774-76) develops the idea that the oldest Biblical poems—the history of Creation, of the Flood, and of Moses—are to be considered Oriental national songs. The usual interpretation of the Mosaic history of Creation as a divine revelation appears to Herder not only indefensible, but pernicious, since it fills the mind with false ideas and leads to persecution of the physical scientist. In 1778 he wrote "Lieder der Liebe," in which he divested the Canticles of all mystical and allegorical accretions. In these deeply felt love-songs he recognized the natural expressions of Jewish sentiment. After having, in his letters on theology, extended this view to the whole Bible, he published (Dessau, 1782-83) his famous "Vom Geiste der Ebräischen Poesie." In a letter to Hamann he wrote that "since his childhood he had nourished it in his breast." He says that Hebrew poetry is the world's oldest, simplest, and most soulful poetry, full of the inner feeling of nature and of the poetic consciousness of God. 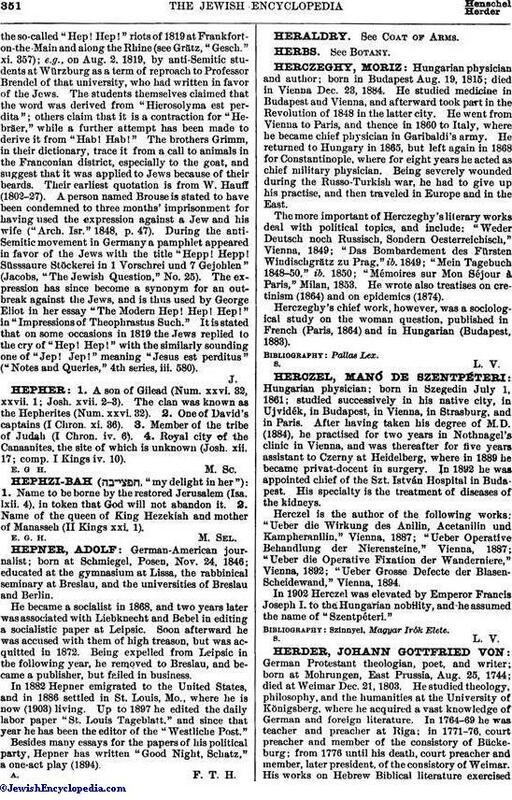 He translated many of the Hebrew poems. According to Grätz ("Gesch." xi. 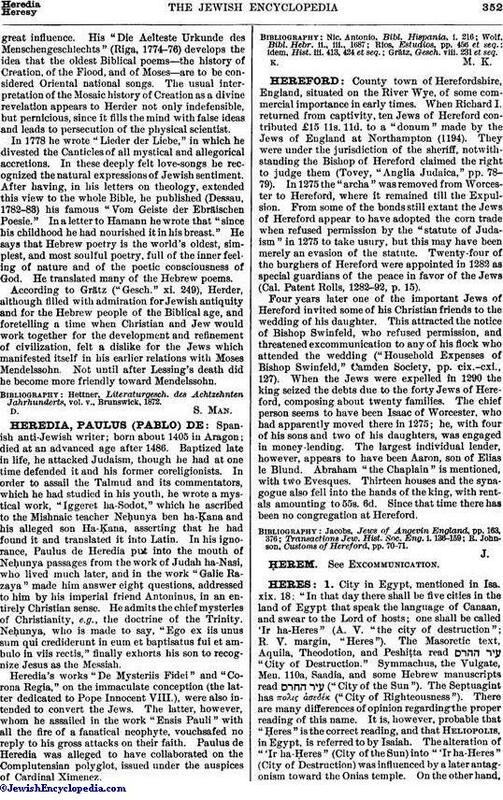 249), Herder, although filled with admiration for Jewish antiquity and for the Hebrew people of the Biblical age, and foretelling a time when Christian and Jew would work together for the development and refinement of civilization, felt a dislike for the Jews which manifested itself in his earlier relations with Moses Mendelssohn. Not until after Lessing's death did he become more friendly toward Mendelssohn. Hettner, Literaturgesch. des Achtzehnten Jahrhunderts, vol. v., Brunswick, 1872.